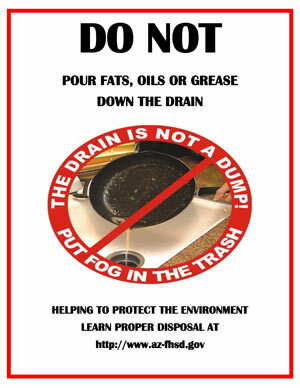 Sanitary sewer systems are not designed or equipped to handle the discharge of fat, oil or grease (FOG) because it congeals and sticks to the interior of pipes. FOG can cause serious, and expensive, backups into private property or in the public sewers. The best way to handle FOG is to keep it out of the plumbing systems in the first place. All food service operations and other commercial businesses must meet the District’s requirements for minimizing the amount of fat, oil, and grease discharged to the sewer system. Most food service or automotive companies will require the installation of a grease trap or interceptor. The District inspects grease traps and interceptors installed at commercial facilities at least once a year. Regular grease pumping by a certified professional is required.